Killing two birds with one stone. Though the saying is rather unfortunate seeing that this is going to be a blog on nature and all things beautiful. But it does feel like it. For I wanted to do something to promote this month's issue of Stamp Magazine and I promised my fan in Sweden (Hej, Ann-Mari!) to do something Swedish. So here I am. Read this month's feature on butterflies yet? You really should as it includes a pic of a most wonderful unaccepted essay for the 1963 GB National Nature Week. Great stuff. Butterflies seem to be a popular thematic subject, for among my philatelic friends I know at least two who collect them on stamps, and I can't think of any other subject that is collected by more than one of my friends. Me, myself, not so much, to be honest. I like 'em enough in real life but a whole collection of butterfly stamps looks a bit samey to me. Almost like a Western version of a communist country collection. But having said that, there's always the one issue that contradicts everything I've thought before, and, yep, you've guessed it, this time it's an issue from Sweden! 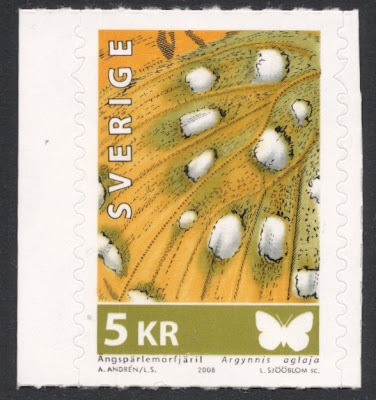 For Sweden issued the most gorgeous butterfly stamps in 2007 and 2008. Four stamps only but, boy, are they wonderful! The great thing about them is that they do not just have a picture of a butterfly on them, like so many others, but they highlight the wonderful colours of their wings, by showing details of those wings. Perfectly done! The first two stamps were issued in 2007 and consisted of the 20kr and 50kr values. 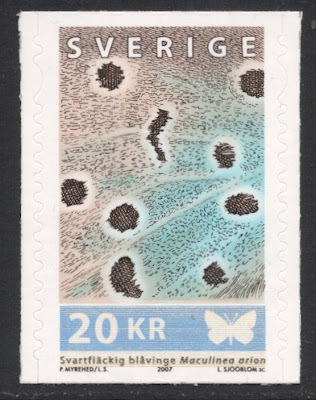 The 20kr depicts the Maculinea arion, or the Large Blue. It is also depicted on the 1981 set from Britain. Here's a good link for you: This butterfly was extinct in Britain until reintroduced from Sweden! 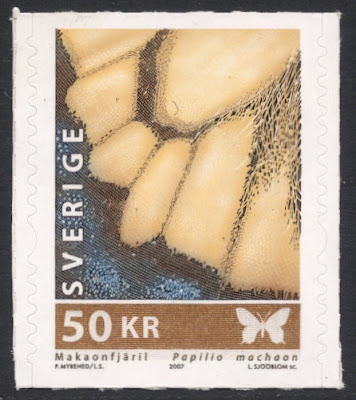 The second 2007 stamp was the 50kr depicting the Papilio machaon, or Swallowtail. 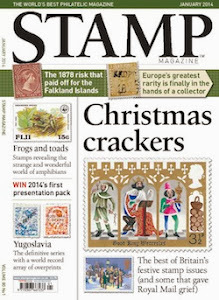 This stamp, as well as the 2008 stamps, has microprint on it. In long lines it repeats the Latin name of the beastie. On to 2008 and we have the 5kr depicting the wings of an Argynnis aglaja, or the Dark Green Fritillary. It can also be seen on a 1993 Isle of Man stamp. 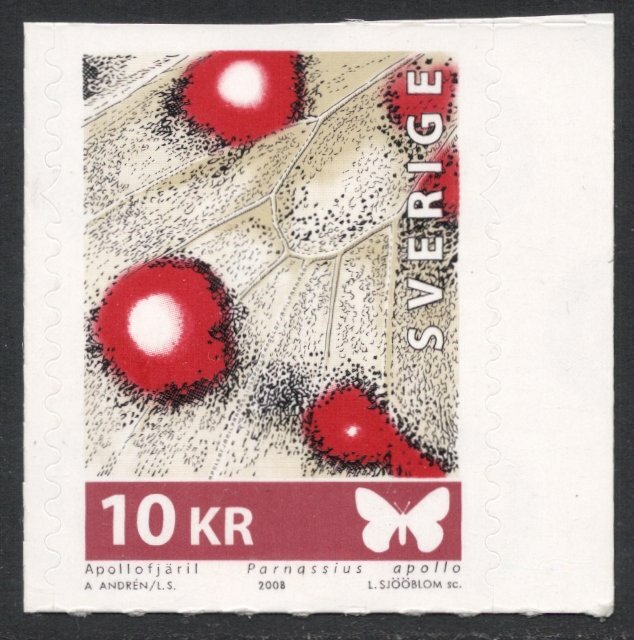 The final stamp is the 10kr depicting a Paranassius apollo, or the (Mountain) Apollo. 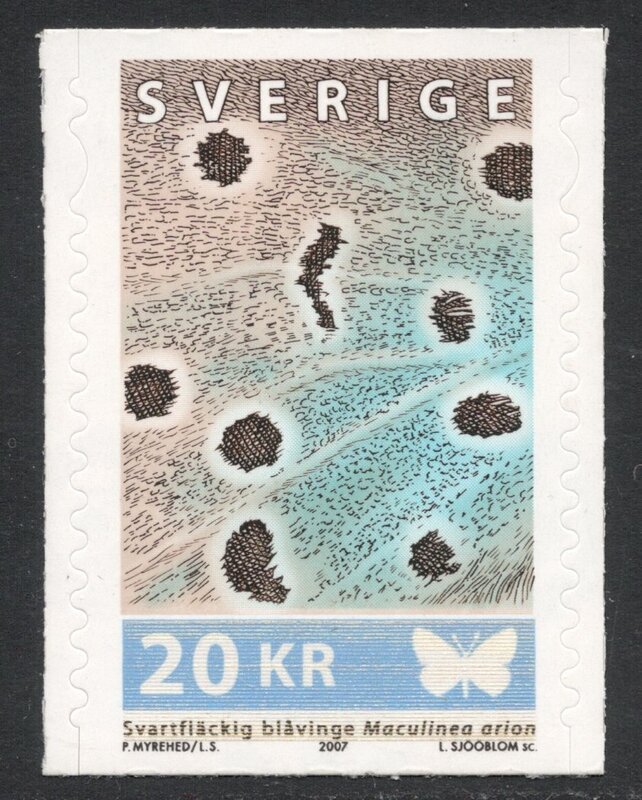 All four stamps are printed in a combination of litho and recess, and they also look stunning under your UV light, with parts of the design having been printed with yellow phosphor ink. The only gripe I have with them is that they are self-adhesive, so they don't display half as nice as ordinary stamps, but I'll just have to grin and bear it and enjoy the design. Which I do, but you will have guessed that by now! did you notice the (new?) safety perforation on these stamps? It is best seen at the 5K stamp.